We all know how absolutely insane Alabama has been this year, beating every team they've played by 20+, shutting out then-No. 3 LSU in Baton Rouge, not playing Tua in the fourth quarter until their ninth game. Alabama has been crushingly dominant in the SEC. But statistically, it's not the most dominant season in college football right now. That honor belongs to the Colgate Raiders. Colgate has played 32 quarters of football this season. They haven't allowed a touchdown in 31 of those quarters. This is just one of many impressive stats from Colgate's season so far. They're 8-0 on the year and have outscored their opponents 239-23. In the past six games, they've given up exactly three points. 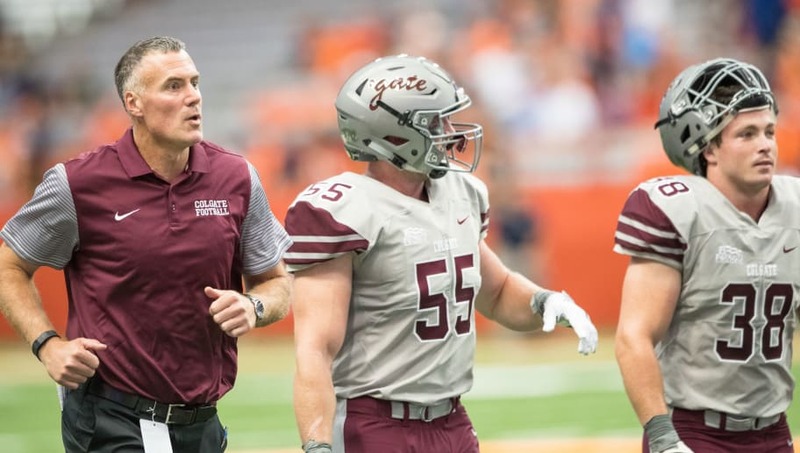 On Saturday Colgate defeated Fordham 41-0, outgained them 562-28 and held Fordham to a seemingly impossible -50 yards rushing. They outgained Georgetown the week before 311-36 and held the Hoyas to -12 rushing yards. The Colgate defense is an absolute terror. Cornell got shutout 31-0 against Colgate but did rush for 136 yards, so the Big Red clearly have the best rushing attack in the Patriot League. Alabama's season is obviously impressive given the competition they're going up against, but Colgate is just squeezing the absolute life out of their opponents this year. I don't think a matchup between these two teams would go very well for Colgate, but I think we shouldn't even consider that and just enjoy the soul-crushing way Colgate is going about making the FCS playoffs. The Raiders next victim is 2-7 Lehigh, who already lost 43-17 to Fordham, so that game is not going to be for the faint of heart.